In fictional decision-making, research on selective exposure (the tendency to expose oneself to consistent information and avoid inconsistent information, Festinger, 1957) shows that this phenomenon may be partly due to a biased evaluation quality of information. The present study seeks to establish whether this biased evaluation also occurs with informational dissonance (Vaidis and Gosling, 2011). More specifically, we examined (1) whether an individual’s attitude or behavior may be biased by information perception; and (2) whether this phenomenon was related to the perception of the information’s novelty. In two successive studies, participants evaluated the quality and the novelty of information and their desire to expose themselves to it. The information in the texts dealt with the effects of passive smoking, alcohol, and electromagnetic waves (Study 1) and GMOs (Study 2). For each of these topics, one text emphasized their harmlessness (tobacco and electromagnetic waves) or the positive effects (alcohol and GMOs), whereas the second presented the negative effects on health. The hypotheses were tested using moderated mediation models. The results differed according to the subjects addressed and the novelty of the information submitted. Among several possible explanations for the findings, we suggest that the valence of the texts on items considered harmful for health plays a role. Selective exposure to information is a central aspect of cognitive dissonance theory (Festinger, 1957, 1964) and is defined as the tendency of individuals to expose themselves to information consistent with their beliefs and to avoid what is inconsistent. This phenomenon was long neglected because of a lack of empirical support for the phenomenon results, but has recently received renewed interest in work on decision-making related to assimilation bias (Fischer, Fischer, Aydin, and Frey, 2010; Fischer, Fischer, Englich, Aydin, and Frey, 2011). The aim of the present study is to investigate the mediating effect of information evaluation (potentially biased: assimilation bias) and the role of novelty on information exposure in the framework of informational dissonance. According to Festinger (1957), individuals tend to maintain consistency between their cognitions, which means the set of beliefs, values, opinions, or attitudes of an individual. Cognitive dissonance is a state of psychological tension that can arise when an individual is confronted with information that is inconsistent with other aspects (e.g. a smoker confronted with information on the dangers of smoking may experience dissonance). This dissonance is qualified as informational (Vaidis and Gosling, 2011). Cognitive dissonance can also result from decision-making (Festinger, 1964), when there is awareness of the negative aspects of the chosen alternative and positive elements about the rejected one. In any case, this psychological tension is particularly uncomfortable and generates a desire to reduce it. A solution allowing to do so is to seek out consistent information. At the same time, an individual may try to avoid situations or information that would increase dissonance. Selective exposure is therefore a dual process: By seeking information that justifies their attitudes, behaviors, or decisions, individuals increase the proportion of consonant elements and decrease the dissonance felt. By avoiding inconsistent information, the individual avoids triggering dissonance or increasing its magnitude (e.g. Freedman and Sears, 1963; Frey, 1986). Informational dissonance and decisional dissonance are conceptually and experimentally distinct. The experimental paradigm for studying informational dissonance involves two stages. The first stage consists in measuring individuals’ behaviors or attitudes towards the issue of interest (e.g. smoking, drinking, voting; see McGinnies and Rosenbaum, 1965; Rosenbaum and McGinnies, 1973), which have an ecological value in that they pre-date the study. The second stage involves measuring selective exposure. Participants read summaries of documents or simply titles (e.g. Freedman & Sears, 1965; Mills, Aronson & Robinson, 1959) that contain information that is either consistent or inconsistent with their attitudes or behaviors (Brock, 1965; Feather, 1962, 1963, 1969). Then, based on this reading, they either select the documents they want to read in their entirety or rank them by order of interest. Selective exposure to information is established when the individual selects more consistent than inconsistent information. When no consistent information is offered, selective exposure corresponds to an avoidance of inconsistent information (Bardin, Perrissol, Fos, and Py, 2017). To induce decisional dissonance, participants read a scenario of a fictional decision-making situation with two exclusive alternatives. After choosing, they are asked to what extent they would like to know more information relating to their initial decision, which will either be consistent or inconsistent (selective exposure measure). Recent studies on this topic suggest that preference for information consistent with a prior decision is preceded by a biased evaluation of that information (e.g. Fischer, Fischer et al., 2011; Fischer, Jonas, Frey and Schulz-Hardt, 2005; Jonas, Schulz-Hardt, Frey and Thelen, 2001; Schulz-Hardt, Fischer, Frey, Lüthgens, and Moscovici, 2000). Thus, individuals tend to evaluate consistent information as being of a better quality than inconsistent information (Ditto, Scepansky, Munro, Apanovitch, and Lockhart, 1998; Ditto and Lopez, 1992; Fischer et al., 2005; Ficher, Lea et al., 2011; Schutz-Hardt et al., 2010). This biased evaluation (i.e., assimilation bias) leads them to prefer exposing themselves to confirmatory information, which seems more credible to them and more important for decision-making. This bias is consubstantial with people’s preference for information confirming their decision. In the framework of the protocol described above, after having made their decision, individuals are asked to evaluate the proposed information as well. They are then asked to confirm or refute their initial decision. Previous research on selective exposure offers mixed conclusions based on heterogeneous results. For example, several studies have investigated health issues (e.g. tobacco: Feather, 1962, 1963; Bertrand, 1979; Brock, 1965; Brock and Balloun, 1967; Bardin, et al., 2017b; alcohol: Perrissol, Boscher, Cerclé, and Somat, 2005; or, more recently, GMOs: Bardin, Perrissol, Facca, and Smeding, 2017a). The results are inconsistent about whether people avoid inconsistent information. For example, concerning tobacco, Feather (1962, 1963) and Brock (1965) did not find an avoidance of inconsistent information, contrary to Brock and Balloun (1967) and Bardin et al. (2017b). Many factors may moderate the selective exposure effect (for a review, see Frey, 1986; Perrissol and Somat, 2009; the meta-analysis of D’Alessio and Allen, 2002, 2007; or Hart and Albaracin, 2009). These factors have been primarily studied within experiments on the decision-making process, and thus few refer to informational dissonance. Among these factors, the novelty of information has often been mentioned (e.g. Jecker, 1964; Sears, 1965; Sears and Freedman, 1965). According to Frey (1981), the tendency to prefer consistent information is stronger when none of the information is familiar, and weaker when individuals are only familiar with inconsistent information. When inconsistent information is already known, individuals are thought to have less need to strengthen their position and, hence, the inconsistent information is less threatening because it has already been processed. Frey and Rosch (1984) and Sears and Freedman (1965), however, found that individuals preferred new information. Sears (1965) demonstrated that even when the information was dissonant, individuals would expose themselves to it if it was new and especially when the decision was irreversible (Frey and Rosch, 1984). New information may also be more useful (Freedman, 1965) and thus lead individuals to expose themselves to it. The present research draws on the theory of informational dissonance resulting from an attitude or a pre-existing behavior and nor from a decision-making in an experimental paradigm. Three effects will be tested. The first goal is to identify whether there is a selective exposure effect in relation to individual behavior. Therefore, we hypothesize that individuals will expose themselves to information consistent with their behavior and avoid information that may call into question that behavior. This has often been assumed but has rarely been validated (Freedman and Sears, 1965; Frey, 1986; Perrissol and Somat, 2009). Generally, following Perrissol and Somat (2009), validating such an assumption requires following certain methodological precautions in designing the experimental protocol. It is therefore necessary to take measurements as discreetly as possible (Lavoie & Thompson, 1972) and to measure exposure before attitudes or behaviors (Olson and Zanna, 1979). The second goal is to determine whether information evaluation has a mediating effect on selective exposure in the framework of informational dissonance. Fewer experiments have been conducted on informational selective exposure than on decisional dissonance. While informational dissonance selective exposure experiments usually test ecological attitudes or behaviors, those on decisional dissonance are often conducted in artificial, experimental conditions. However, to our knowledge, no study on informational dissonance has sought to demonstrate a bias in evaluating the quality of the information offered. As with studies on decision-making, it is likely that information consistent with an individual’s attitude or behavior will be evaluated more favorably than inconsistent information. Thus, we hypothesize that individuals will evaluate information consistent with their behavior more favorably than inconsistent information. This evaluation will lead them to prefer exposing themselves to consistent information. The mediation hypothesis will be examined in relation to the perceived novelty of the information. As with information evaluation, to our knowledge, most experiments on selective exposure and information novelty have been conducted in the framework of decisional dissonance. They indicate that new information arouses curiosity and leads individuals to expose themselves to it regardless of whether it is consistent or inconsistent with their attitudes or behaviors. Hence, we hypothesize that the effect of behavior on information exposure will be mediated by the evaluation of its quality, with this mediation in turn being moderated by the novelty of that information (Figure 1). Mediation moderated model for the tobacco and alcohol (Pros and cons). “… [I]t is one of the symbols of French tradition and gastronomy. Its consumption is associated with festive occasions, and other moments of conviviality such as family reunions and after-work meetings. It is systematically consumed to celebrate major events of social life: births, weddings, relocation, professional or sports successes, etc. Alcohol is appreciated for its taste, but also for its socializing, relaxing, and euphoric virtues.” (Alcool Info Service, a public information service, translated by the authors). In contrast, tobacco consumption is never the subject of positive discourse. Moreover, in France, advertisements for alcohol are allowed, while those on tobacco are prohibited. As with tobacco, it would be difficult to believe discourse that alcohol has no harmful effects. However, it is possible to provide information on both the benefits and the risks of alcohol consumption. Finally, the subject of electromagnetic waves emitted by everyday electronic devices (cellphones, wifi, antennas) has certain similarities with tobacco in the 1960s: People use devices emitting electromagnetic waves while ignoring whether this has adverse effects on their health. Ninety-four participants from the general public, 65 women and 29 men (Mage = 37.90, SD = 11.09), took part in this research. Twenty-two smoke at least one cigarette a day. There were 46 non-smokers and 26 former smokers. Former smokers’ data were not included in the analysis on passive smoking. Following Bardin et al. (2017a), they were excluded because they constitute a very heterogeneous group (especially their quit date). Forty-two participants declared that they consume alcohol while 52 answered they did not. Only four participants do not use a cell phone; therefore, it was not possible to analyze exposure to information on electromagnetic waves for this behavior. To confirm that smoking is more stigmatized than alcohol consumption, 60 third-year undergraduate students answered the questions “nowadays smoking/drinking alcohol is a stigmatized behavior” on a seven-point scale (from 1 “strongly disagree” to 7 “strongly agree”). The analyses confirmed that drinking alcohol (M = 2.63, SD = 2.43) was less stigmatized than smoking (M = 3.32, SD = 1.29), t(59) = 3.79, p < .001, d = 0.50). For each topic (tobacco, alcohol and electromagnetic waves), two short texts1 (354 and 381 words) were created using a variety of information found in the press and on the internet. For tobacco, one text mentioned the negative effects of passive smoking (con-tobacco text), whereas the second argued that there were no negative effects of passive smoking (pro-tobacco text). For alcohol, one text defended the benefits of moderate consumption (pro-alcohol text) while the second warned of its risks (con-alcohol text). Finally, one text exposed the dangers of electromagnetic waves (con-electromagnetic waves text) while a second one emphasized their harmlessness (pro-electromagnetic waves text). Traditionally, assimilation bias (information evaluation) is measured with two items that indicate the credibility and the importance of a piece of information for decision-making. Relevance also seems to influence information collection (e.g. Ditto and Lopez, 1992; Ditto et al., 1998). To measure the relevance of information and calculate a global information evaluation score, we used a larger number of items. Participants indicated on a five-point scale (from 1 “strongly disagree” to 5 “strongly agree”) the extent to which the text they had just read was clear, believable, sincere, persuasive, interesting, serious and convincing, and this for each of the 6 texts. The novelty of the information is a measured variable. For each of the six texts, participants had to indicate on a five-point scale (from 1 “strongly disagree” to 5 “strongly agree”) the extent to which they considered that the information was new. Participants had to declare if they smoked and/or drank alcohol and if they answered positively, which type of alcohol (beer and/or liquor). They also had to indicate if they used a cellphone on a daily basis. Experimenters sent a request to participate in a social psychology experiment to organizations and people in their networks (e.g. associations) and asked them to transfer the information to potential participants. The entire protocol was computerized and accessible over the internet. Participants connected to the website server hosting the study by using a link that they had been given. The homepage told participants that they would take part in an evaluation of texts for a study on prevention. This message was followed by an informed consent form they had to sign. They were also asked to enter a password given by the experimenter to secure the experiment. Then they were told that they would evaluate texts created through a combination of information found on the internet and that these texts related to tobacco, alcohol, and exposure to electromagnetic waves. It was also made clear that for each topic, they would read one text warning against the dangers and one text presenting their potential benefits or absence of harmful effects. Participants evaluated each text immediately after reading it and without the opportunity to read it again (in the following order: con-tobacco, pro-tobacco, pro-alcohol, con-alcohol, pro-electromagnetic waves, and con-electromagnetic waves). Selective exposure was measured after each evaluation. At the end of this first phase, participants answered questions on their behaviors in using these three objects. Finally, they were thanked and debriefed. They could leave their email address to receive the study’s results. Factor analysis was conducted on all items for the six texts and showed only one factor (without rotation). Cronbach’s alpha revealed good internal consistency (all α > .87) which allowed us to calculate an information evaluation score for each text. No difference was found between information evaluation scores of the three pro-texts, (F(2, 186) = 0.62, p = .54, η2 = .007). Similarly, no difference was found for the three con-texts (F(2, 186) = 0.82, p = .54, η2 = .009). Descriptive statistics are presented in Table 1. The con-texts were evaluated as being of better quality than the pro-texts: tobacco: t(93) = 3.13, p = .002, d = 0.32; alcohol, t(93) = 4.14, p < .001, d = 0.43 and electromagnetic waves, t(93) = 4.71, p < .001, d = 0.49. Information evaluation depending behavior, means and standard deviations. C = alcohol consumers/smokers, N.C. = non consumers/non-smokers. As the two items were highly correlated for each text, we computed a mean score for selective exposure (pro-tobacco, r = .84, p < .001; con-tobacco, r = .88, p < .001; pro-alcohol, r = .90, p < .001, con-alcohol, r = .87, p < .001; pro-electromagnetic waves, r = .93, p < .001; con-electromagnetic waves, r = .93, p < .001). Regarding alcohol and tobacco consumption measures, two dichotomous variables were created, one for each (yes/no). As indicated above, no variable of this type could be created for electromagnetic waves. Analyses were conducted to determine whether the information in the texts was considered new. As the evaluation of information novelty was on a five-point scale, we considered that information was new when participants gave a score greater than three, which is the central value of the scale. Novelty scores for the texts con-tobacco, con-alcohol, pro-alcohol and pro-electromagnetic waves were not higher than 3. On the other hand, texts related to pro-tobacco (M = 3.37, SD = 1.10, t(93) = 3.29, p = .001, d = 0.34) and con-electromagnetic waves (M = 3.50, SD = 1.09, t(93) = 3.50, p < .001, d = 0.46) were considered as providing new information. Descriptive statistics are presented in Table 2. Information novelty, means and standard deviations, all participants taken together. Descriptive statistics and correlations for the pro-tobacco texts. Note: The correlation is statistically significant for a threshold of *.05 and **.01. Descriptive statistics and correlations for the con-tobacco text. Descriptive statistics and correlations for the pro-alcohol texts. Note: The correlation is statistically significant for a threshold of **.01. Descriptive statistics and correlations for the con-alcohol texts. Descriptive statistics and correlations for the pro-waves texts. Note: The correlation is statistically significant for a threshold of *.05. and of **.01. Descriptive statistics and correlations for the con-electromagnetic waves texts. No effect was found regarding gender and age. Therefore, these variables were excluded from the analyses. First, analyses were conducted to test the hypothesis that smokers and alcohol consumers perceived information quality differently from, respectively, non-smokers and non-alcohol consumers. In other words, the goal was to check whether participants made an assimilation bias (evaluation consistent information as better than inconsistent). Second, analyses of moderated mediation models were conducted. For tobacco and alcohol, a biased information evaluation score was computed by subtracting the values for con-texts from the values for pro-texts by consumer type. T-tests against zero were preformed to confirm potential evaluation bias (overestimation of consistent information quality). No biased information evaluation was found for smokers (M = 0.31, SD = 1.07, t(21) = 1.34, p = .20, d = 0.29) who did not overvalue consistent information (pro-texts) compared to inconsistent information (con-text). Non-smokers evaluated the con-texts as higher quality than the pro-texts (M = –0.53, SD = 1.01, t(45) = –3.59, p < .001, d = 0.52). Alcohol consumers (M = –0.27, SD = 1.01) and non-consumers (M = –0.66, SD = 1.06) rated the con-texts as higher quality than the pro-texts, respectively (t(52) = –1.96, p = .055, d = 0.27 and t(41) = –4.02, p < .001, d = 0.62). Participants considered the text on the dangers of electromagnetic waves as higher quality than the text explaining their safety (M = –0.51, SD = 1.05, t(93) = –4.71, p < .001, d = 0.49). Moderated mediation analyses were generated by a macro for SPSS, PROCESS v.2.16.2. using Model 14 (Hayes, 2013, http://www.processmacro.org/index.html), which uses an OLS regression procedure (ordinary least squares). The bootstrap analyses (bootstrap with 95% bias-corrected bootstrap confidence intervals based on 10,000 bootstrap samples) confirmed the model as significant only for the pro-tobacco texts. The analysis used three regression models to test the effect of consumer behavior on selective exposure through information evaluation (mediator) at different conditional values of the proposed moderator: the information’s novelty (Table 4). Regression coefficients, standards errors and model summary information for moderated mediation pro-tobacco texts. The first model regressed selective exposure on smoking behavior (R2 = .08, B = –0.84, F(1, 66) = 5.48, p = .02). As expected, smokers sought out more pro-tobacco information than did non-smokers. The second model regressed information evaluation on smoking behavior. The third model regressed selective exposure on smoking behavior, information evaluation, information novelty, and their interaction. An interaction effect between information evaluation and information novelty was found on exposure (Figure 3). The moderated mediation model was significant (F(4, 63) = 3.11, p = .02, R2 = .17 [Figure 2]). The indirect effect of smoking behavior on selective exposure through information evaluation decreased when the information novelty increased. The index of moderated mediation (Hayes, 2015) is “a quantification of the association between an indirect effect and a moderator” (p. 2). Thus, the index of moderated mediation is the weight of information novelty in the function linking the indirect effect of smoking behavior on selective exposure via information evaluation (mediator). Conditional indirect effect of smoking behavior on selective exposure to pro-tobacco information. Légende: * < 0.01, † ns, () simple effects. Interaction effect between information novelty and evaluation on selective exposure. The index of moderated mediation was –0.38. Analyses confirmed that the indirect effect of smoking behavior through information evaluation on selective exposure was moderated by information novelty (95% CI [–.95; –.02]). We also tested conditional indirect effects to examine the effect of information evaluation at different values of information novelty (+/– 1 SD from moderator’s mean) on selective exposure. Probing interaction with this pick-a-point approach reveals a mediating effect for medium and high levels of novelty (respectively B = –.56, SE = .36, 95% CI [–1.50; –0.03] and B = –1.00, SE = .54, 95% CI [–2.41; –0.18]). In these conditions, the higher the evaluation, the greater the selective exposure score. In this model, the direct effect of smoking behavior disappears. Consumption behaviors did not predict information exposure for the texts con-tobacco (B = –0.27, F(1, 66) = 0.13, p = .72), nor for pro- and con-alcohol (respectively B = 0.94, F(1, 92) = 2.44, p = .12 and B = 0.17, F(1, 92) = 0.08, p = .78). Consequently, related moderated mediation models were not tested. Concerning electromagnetic waves, we tested the interaction effect between information evaluation and information novelty on selective exposure. No effect was found for the pro-texts (F(1, 86) = 1.85, p = .18). Information evaluation predicted selective exposure to the con-texts (B = 0.66, F(1, 88) = 17.75, p < .001). This first study sought to show whether consuming behaviors influenced information evaluation and information exposure, with this effect moderated by perceived information novelty. Concerning information evaluation, the results differed depending on the topics. For tobacco, non-smokers were the only ones who made a biased evaluation (assimilation bias). They considered that the text on the dangers of passive smoking was of better quality than the one on the lack of dangers. However, concerning alcohol, the text dealing with the dangers of alcohol consumption was evaluated more positively than the one dealing with its benefits, and this regardless of consumption behavior. Unlike alcohol, results concerning tobacco differed according to behavior. One explanation may reside in differences in the type of information in the two pro-texts: The pro-alcohol text deals with the benefits of alcohol consumption, whereas the pro-tobacco one (and for electromagnetic waves) deals with the lack of harmful effects. This discrepancy may also be explained to individuals not being affected by both objects. For example, smokers are affected since they are the main party responsible for the potential damages of smoking onthose around them. Non-smokers are, however, the potential victims of passive smoking. Information on its dangers is more useful for justifying their desire to avoid it and is in line with a precautionary principle. Even though smokers did not show an assimilation bias, this result should be considered with caution given the relatively small sample size (respectively n = 22 and n = 46). In addition, smokers evaluated the information on the lack of danger from passive smoking more favorably than did non-smokers. The dangers of passive smoking are one of the most important reasons for smokers’ stigmatization. Information about its harmlessness would allow them to fight against this stigmatization and even reduce the dissonance experienced by the idea of impairing someone else’s health. Additionally, the effect of evaluation on exposure was present only when perceived novelty was high. When participants felt that the information on the lack of harmful effects of passive smoking was not new, evaluation predicted exposure. The idea that passive smoking has no effect was practically non-existent in the texts. Novelty may lead individuals to give weight to information evaluation before choosing to be exposed to it. In our opinion, this effect is central and may explain the inconsistency of selective exposure results in other research on informational dissonance. In experiments on selective exposure in decision-making, the information is new. For instance, in Mr. Miller’s paradigm (e.g. Fischer, Lea, et al., 2011, experiment 5; Fischer, Schulz-Hardt and Frey, 2008, experiment 3; Fischer, Fischer, Weisweiler and Frey, 2010, experiment 1), participants have to decide whether Mr. Miller should be fired. Once the decision is made, participants are asked to consult new information (consistent and inconsistent) concerning Mr. Miller, such as that his work has been satisfactory and his contract can be extended. However, in experiments in informational dissonance, participants already know some information. For example, Bardin et al. (2017a) asked French participants about their willingness to expose themselves to a documentary on the potential harmful effects of GMOs. This kind of information has been widely reported in the European media (Gaskell, Bauer, Durant, and Allum, 1999) and participants can expect to be exposed to information that is well-known. Similarly, in the present study, only two of the six texts were considered as offering new information. This lack of novelty of information on alcohol may partly explain the lack of results on this object. Nevertheless, in this experiment, participants assessed novelty based on what they had already read; they did not expect to receive new information later that might cause dissonance, as in Mr. Miller’s paradigm. While Study 1 clearly contributes to understanding selective exposure in regard to informational dissonance, the present experiment is not devoid of limitations. The presentation order of the texts was not counterbalanced, and thus we could not exclude the possibility that the effect concerning tobacco was related to the fact that participants had to evaluate it first. A reporting fatigue effect may therefore explain the lack of effects on alcohol and electromagnetic waves. Furthermore, although the form of the texts was similar, their arguments were different; this may have affected results. No precise information was given to participants about the source of the texts. Therefore, we decided to reproduce the study using an object whose effects concern everyone. In the first study, passive smoking affects both smokers and non-smokers, whereas alcohol only involves consumers. We also decided to assess participants’ attitudes instead of their behaviors, since Study 1 only measured the latter. Attitudes cannot be presumed solely based on behaviors, as has been largely established (see for instance Krauss’ meta-analysis, 1995), and their relationship may be problematic in health issues, especially addiction. For example, the model by Prochaska and DiClemente (1986) postulates that the process of quitting smoking has several stages. In the first stage (precontemplation), the person does not consider quitting smoking. In the second stage (contemplation or expectation), the person considers the possibility of quitting in the following six months. In both cases, the consumption behavior is the same but the attitude is likely to be different. A person in the precontemplation stage will have a positive attitude toward smoking and will be inclined to develop strategies of selective exposure, whereas a person in the contemplation stage will develop a less favorable attitude towards smoking. According to Noel (1999), the latter would be more inclined to consider health education information. Even though the information given in Study 1 on tobacco did not directly concern the negative effects of tobacco use, information on the risk of passive smoking is consistent information and even an additional motivation to quit smoking. Finally, although electromagnetic waves may be a relevant study object since everyone is potentially exposed, today it is difficult to make a credible argument about their potential health benefits. GMOs, however, were the object chosen for Study 2, since they concern everyone and it is possible to make a credible argument concerning their health benefits. Bardin et al. (2017a) showed that attitudes toward GMOs influence exposure to information on GMOs’ harmful health effects. Therefore, we decided to replicate Study 1 using GMOs and examining attitudes. This follow-up study sought to reproduce the results of the first study while overcoming its principal limitations mentioned above. More precisely, it addressed issues of lassitude, source credibility, the lack of attitude measures, and the difference in text content. To do so, only one topic was assessed (i.e. GMOs) and participants evaluated either a consistent or an inconsistent text. This single evaluation enabled us to use one text for which we then modified the pro and con aspects. This choice meant we could not test the occurrence of assimilation bias (intervariable). However, it enabled us to introduce ‘nature of the text’ as an independent variable in interaction with participants’ attitudes toward the topic. This second study tests the following model (see Figure 4). Mediation moderated mode, indirect effect of attitude on exposure to information. Fifty-eight people, 46 women and 12 men (Mage = 39.90, SD = 19.21), took part in this study. One participant took over 90 minutes to answer all the questions and was consequently excluded from the analysis. In the end, the data of 57 participants were used, 27 in the pro-GMO set (21 women) and 30 in the con-GMO set (24 women). An attitude scale toward GMOs (Bardin et al., 2017) was adapted to GM food. Participants had to give their attitude on a seven-point scale with seven items, such as “I am against the use of GMOs in human food” (see the Appendix for the complete questionnaire). Participants had to indicate on a seven-point scale (from 1 “strongly disagree” to 7 “strongly agree”) the extent to which the text was clear, believable, sincere, persuasive, interesting, and rigorous. For each text, participants had to indicate on a seven-point scale (from 1 “strongly disagree” to 7 “strongly agree”) the extent to which they consider that the article they had just read included information they did not know. After reading the summary, participants had to indicate on a seven-point scale (from 1 “strongly disagree” to 7 “strongly agree”) the extent to which they wanted to read the original article. Participants were recruited through an advertisement on the RISC website of the CNRS (Relais d’Information Sur les Sciences de la Cognition [Information on cognitive sciences]). This ad was also sent to the mailing list of RISC volunteers. The study was briefly presented as research in social psychology on nutrition. It was specified that they would have to answer some questions and read a short text. Participants were randomly assigned to the two experimental groups (pro-GMOs or con-GMOs). As in the first study, participants signed a consent form. As a first step, they had to complete the attitude toward GMOs scale. Then, they read the pro- or con-texts on GMOs in food. Afterwards, they completed the measures assessing the text, the novelty, and information exposure. They were then redirected to a debriefing page explaining the measures and stating that the information was false (both source and content of the texts). Participants were thanked and had the opportunity to contact the researchers in charge of the study with questions or comments. Reading times of the text and completion time of the entire study were recorded. Factor analysis (one factor without rotation) was used to determine the evaluation score for each text (pro-GMOs, α = .87; con-GMOs, α = .92). The con-GMOs evaluation score (M = 5.06, SD = 1.38) was higher than the pro-GMO text (M = 3.66, SD = 1.36), t(55) = 3.85, p < .001, d = 1.02). Principal component factor analysis with oblimin rotation was conducted on the seven items of the attitude toward GMO scale. Only one factor explained 73.29% of variance (without rotation). Furthermore, Cronbach’s alpha was .94. These analyses provided a score for the attitude toward GMOs in food: the higher the score, the more negative attitude the participant had toward GMOs in food. Means, standard deviations, and correlations are presented in Table 5. Descriptive statistics and correlations all participants taken together. Note: the correlation is statistically significant for a threshold of **.01 and *.05. The average time to read the text was 38.28 seconds. The entire experiment lasted on average 5 minutes and 48 seconds. No effect of gender was found on all other variables. Consequently, gender was excluded from the analyses. An age effect was found only on selective exposure (β = –.36, F(1,55) = 8.23, p < .006). Thus, this variable was introduced as a covariable for the selective exposure measurement in the tested model. The information evaluation score was higher for the con-GMOs texts (M = 5.06, SD = 1.38) than the pro-GMO texts (M = 3.66, SD = 1.36), t(55) = 3.85, p < .001, d = 1.02). Information novelty con-GMOs scores (M = 5.53, SD = 2.60) did not differ from those of the pro-GMOs text (M = 5.44, SD = 2.49, t(55) = 0.21, p = .84, d = 0.04). Since the scale was on seven points, information was considered to be perceived as new if participants indicated scores greater than the central value (four points). Novelty scores of both pro- and con-GMOs texts were greater than four (respectively, t(26) = 4.76, p < .001, d = 0.91 and t(29) = 5.21, p < .001, d = 0.95). Moderation mediation analyses were performed by PROCESS using Model 21 (bootstrap with 95% bias, corrected bootstrap confidence intervals based on 10,000 bootstrap samples). The analysis used three regression models to test the attitude effect moderated by the type of text (pro versus con) on information evaluation (mediator) moderated by information novelty on selective exposure (see Table 6). Regression coefficients, standard error, and model summary information (depicted in figure 5). First, selective exposure was regressed on attitude toward GMOs (R2 = .29, β = .40, F(2, 54) = 11.73, p = .001). Second, information evaluation was regressed on attitude toward GMOs, type of text, and their interactions. Finally, selective exposure was regressed on information evaluation and information novelty, and their interaction as well as on attitude toward GMOs and gender. The moderated mediation model (Figure 5) was significant. 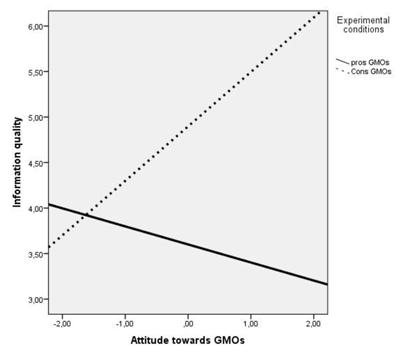 Conditional indirect effect of attitude toward GMOs on selective exposure to information. Legend: *** < .001, ** < .01, * < .05, () simple effects. The index of moderated mediation was –0.15. This index was the weight of text type (pro- versus con-GMOs) and information novelty in the function linking the indirect effect of attitude on selective exposure through information evaluation (mediator). A bootstrap analysis (10,000 iterations) confirmed an indirect effect of the interaction between attitude and type of text through the interaction between information evaluation (mediator) and information novelty on selective exposure (95% CI [–.31; –.03]). Attitude’s indirect effect on selective exposure decreased when the novelty of information increased. We tested conditional indirect effects. These analyses examined whether the effect of attitude on information exposure was mediated by information evaluation at different levels of moderators. A moderator effect of the type of text on attitude was found only when the text was con-GMOs (Figure 6). Thus, in this case, the more negative the attitude toward GMOs in food, the more the text was considered to be of good quality (B = –.13, SE = .05, 95% CI [–.22; –.03]). Interaction effect between attitude toward GMOs and experimental condition on information evaluation. 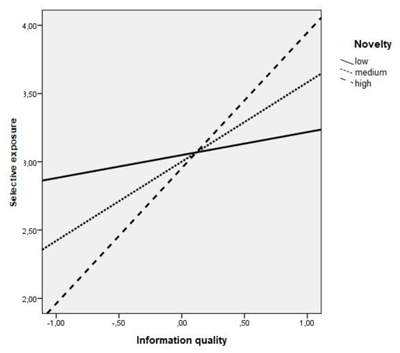 Concerning the third regression model, the interaction between evaluation of quality information and novelty of information effected selective exposure (Figure 7). More precisely, testing interaction with this pick-a-point approach (+/– 1 SD from moderator’s mean) revealed a mediator effect for low levels of novelty (B = –.35, SE = .18, 95% CI [.03; .73]). 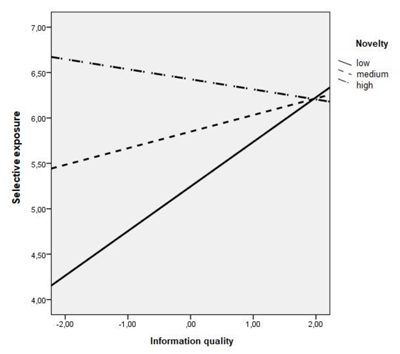 In the con-GMO group, the attitude effect towards GMOs on information exposure was mediated by information evaluation and was moderated by information novelty when quality was considered as being low-level. Interaction effect between information evaluation and information novelty on selective exposure. The goal of this second study was to confirm whether there was an information evaluation bias related to attitudes, to complement the first study done with behavior. Using a single text enabled us to compare information processing according to its benefits versus harmful effects on health. The findings showed that attitude influenced information evaluation. In other words, in the framework of informational dissonance, attitude can generate a biased perception of the proposed information, equivalent to decision in the framework of decisional dissonance. Nevertheless, this effect was only present when information dealt with GMOs’ negative effects. Inconsistent information was evaluated independently of a person’s attitude, whereas consistent information was biased by attitude. In other words, the assimilation bias was only linked to biased consistent information processing and not to a negative evaluation of inconsistent information. In addition, information evaluation had an effect on information exposure when its novelty was weak. This indirect effect of attitude decreased when the novelty of information increased. Thus, when the information was well known, people exposed themselves to information consistent with their attitudes, since they evaluated that information as being of high quality. Nevertheless, when the information was new, evaluation was no longer decisive for choosing whether to expose oneself to it. Assimilation bias led people to selectively expose themselves only when the information was familiar. It would seem that high novelty leads people to neglect information evaluation processing. Currently, most research on the selective exposure effect has been done within the framework of decisional dissonance. These studies have shown that selective exposure was linked to a partisan evaluation of information (e.g. Fischer, Fischer et al., 2011; Fischer et al., 2005). More precisely, people tend to expose themselves to information that is consistent with their decision. To our knowledge, the idea that partisan information evaluation leads to selective exposure has never been demonstrated in work on informational dissonance. Thus, the goal of this study was to examine whether information evaluation bias leads individuals to selectively expose themselves, and whether that effect may depend on perceived information novelty. In both studies here, the texts on harmful effects were usually better evaluated than those on positive effects (alcohol and GMOs) or the lack of negative effects (electromagnetic waves, tobacco). The harmful effects of GMOs, alcohol, and passive smoking were more likely to be reported than their positive or neutral equivalents. This evaluation may be influenced by current negative discourse toward the objects selected. In order to verify this possibility, one avenue for future research would be to reproduce the study on GMOs with American participants, since the discourse on GMOs’ benefits is more widespread there than in Europe (Gaskell et al., 1999; Hudson, Caplanova, and Novak, 2015). In that case, the effect of novelty may be identical to the one obtained in the first study. In any case, these results should be reproduced by modifying the level of novelty of information (new versus well-known) instead of merely stating ‘new’. In the second study, we provided false and thus ‘new’ information. Nevertheless, contrary to paradigms such as Mr. Miller’s, it is difficult to completely manipulate information. The participant may have an impression of déjà-vu (Cleary, 2008) when the information deals with the harmful effects on health. Similar information is ubiquitous in our societies and likely to create a familiarity effect. Moreover, in both studies, the selective exposure measure used was fairly simple. As in earlier research, the participant did not truly expect to be exposed to additional information. Brock (1965) found that participants who expected to read the selected information in a first step were the only ones to demonstrate selective exposure behavior. Another alternative would involve exposing individuals to information and measuring selective exposure more subtly. Brock, Albert and Becker (1970) measured the time spent reading a piece of information. In addition, Brock and Balloun (1967) proposed parasite discourses, where the participant could remove parasites in order to hear better. Using real exposure measures, or at least allowing participants to believe that their choice will determine whether they are really exposed to information, would open up new avenues for research in this area. This partisan evaluation also challenges the distinction proposed by Chaiken, Liberman and Eagly (1989) between defense motivation and accuracy motivation. Defense motivation is the willingness of individuals to defend their attitudes, beliefs, and behaviors. Accuracy motivation is the willingness to evaluate a stimulus accurately. In a decisional context, the dissonance that may arise after a decision should encourage individuals to be motivated to accuracy in making the best choice. Nevertheless, their biased evaluations lead them to selectively favor consistent information. In other words, we can presume that in forming an attitude, an individual is motivated by accuracy. Once the attitude is constructed, defense is then the chief motivation. The present findings tend to support the defense motivation, which generates a biased evaluation of the information and leads people to expose themselves selectively, although this bias only seems to concern consistent information. Moreover, this biased perception may be unconscious (in the sense that the individual is not aware of bias). According to Nisbett and Wilson (1977) or Greenwald and Banaji (1995), individuals have limited capacities of introspection. In some areas, they do not have conscious access to their attitudes. Yet this attitude may be assessed using implicit measures (e.g. IAT, Greenwald, McGhee and Schwartz, 1998; SCIAT-P, Bardin, Perrissol, Launay, Py, and Escoubès, 2014; Bardin, Perrissol, Py, Fos and Souchon, 2016). For example, in politics, implicit attitudes from undecided voters toward candidates may predict their vote (Galdi, Arcuri and Gawronski, 2008; Friese, Smith, Plischke, Bluemke and Nosek, 2012). One may therefore assume that individuals do not have access to their attitudes, although the latter may already shift their evaluation and exposure to related information. In addition to finding a biased perception effect of information quality by people’s attitudes as a factor of selective exposure, these results question the validity of some pre-tests in persuasive communications and analyses of prevention campaigns. The results suggest that a person’s attitude leads to their “objective evaluation” of information. For instance, pre-tests, which evaluate a text’s credibility, may be biased by a person’s attitude when the text is consistent with his/her attitude. Similarly, prevention campaigns often involve asking people their assessment of the prevention message. For example, part of evaluating the effectiveness of an AIDS prevention campaign (see http://preventionsida.org/2016/03/evaluation-ete-2015/) involved asking people about their views on the campaign. In light of the present results, such an evaluation may also depend on individuals’ attitudes and on the protection behaviors they have previously adopted. Finally, the results on novelty may explain the limited efficacy of prevention campaigns. Prevention information is generally already well-known (e.g. smoking causes cancer) and therefore not likely to generate a desire to expose oneself to it. One solution may be to arouse curiosity or present arguments that are less well-known so that the people have more interest in the information. 1The texts are presented in the Appendix. 2Participants were also asked the following question: “If you had to work on one of these topics to improve its content, which would you pick?” They were allowed to choose only one text. The results of this item will not be presented in the scope of the present article. 3All raw data corresponding to all of the results presented in this paper are available at https://osf.io/fkja8. Alcool Info Service. (2018). Le poids économique et culturel de l’alcool. Retrieved from: http://www.alcool-info-service.fr/alcool/consommation-alcool-france/culture-alcool-consommation-vin. Chaiken, S., Liberman, A., & Eagly, A. H. (1989). Heuristic and systematic information processing within and beyond the persuasion context. In: Uleman, J. S., & Bargh, J. A. (eds. ), Unintended thought, 212–252. New York, NY, US: Guilford Press. D’Alessio, D., & Allen, M. (2007). The Selective Exposure Hypothesis and Media Choice Processes. In: Preiss, R. W., Gayle, B., Burrell, N., Allen, M., & Bryant, J. (eds. ), Massmedia effects research: Advances through meta-analysis, 103–118. Mahwah, NJ, US: Lawrence Erlbaum Associates Publishers. Festinger, L. (1964). Conflict, decision, and dissonance. Palo Alto, CA, US: Stanford U. Press. Jecker, J. D. (1964). Selective exposure to new information. In: Festinger, L. (ed. ), Conflict, decision and dissonance, 65–81. Stanford, CA. Stanford University Press. Vaidis, D., & Gosling, P. (2011). Is commitment necessary for the arousal of informational dissonance? International Review of Social Psychology/Revue Internationale de psychologie Sociale, 24, 33–63.